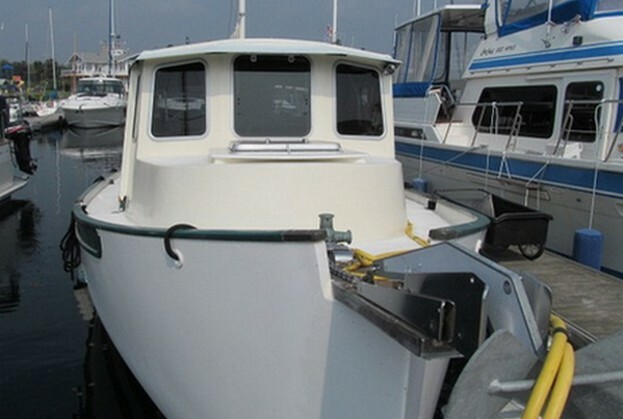 I have always been attracted to odd boats and like her two predecessors, this is a one-of-a-kind. 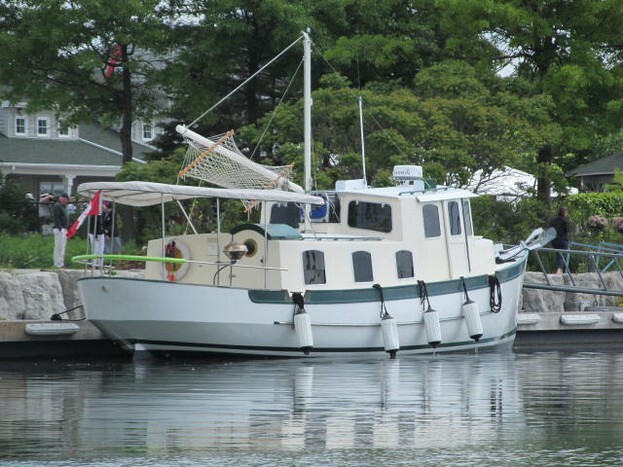 She is a Jay Benford design "Fantail 38 Launch" built in 2001.38' X 12' X 3', Full displacement, foam cored polyester/fiberglass hull with the exterior covered with one layer of epoxy/fiberglass with the bottom coated in coal tar epoxy. 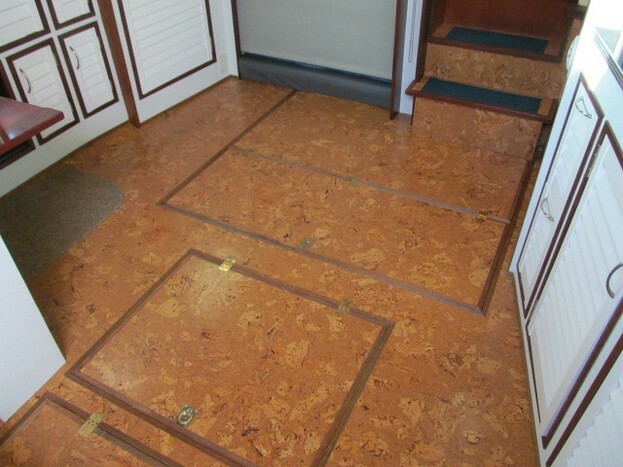 Superstructure/decks - FRP covered plywood. She is powered by a Westerbeke 55hp natually aspirated diesel which pushes her at about 7.5 knots using 3/4gph. 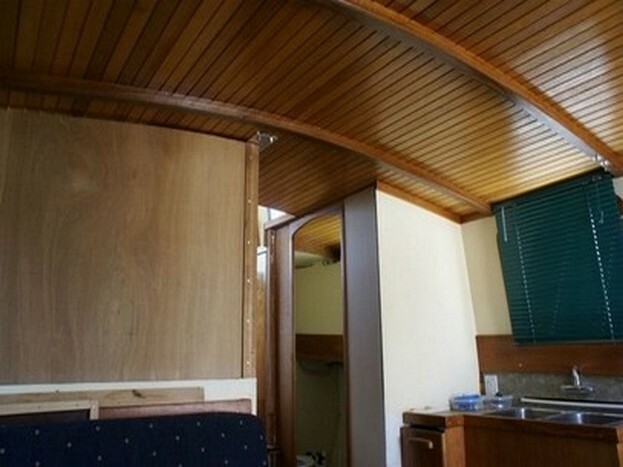 Although the structure was sound just about everything else needed a complete refit. 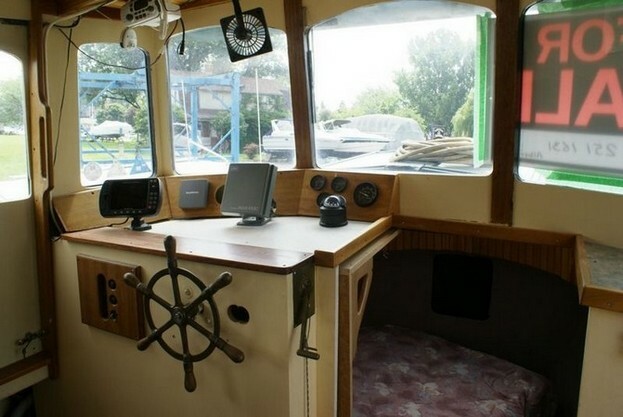 The interior was never quite finished and was largely just painted plywood and this is fine by me as I would have torn it out anyway to do it my way. 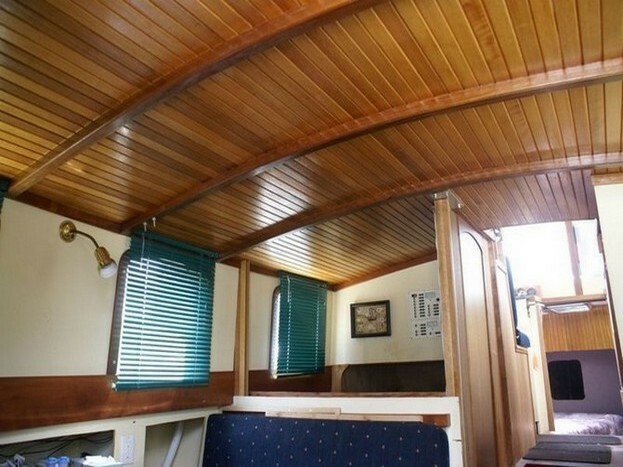 The hull is the most spectacularly fair hull I have ever seen, not a wave, ripple, bulkhead hard spot or mold dimple in sight but the systems were a mess. In fact when I picked it up the alternator was not even connected to the battery and every time it rained the engine compartment filled with water. The decks and superstructure are glass over ply and in some areas this was poorly done and much of the glass had to be ripped off and re-applied (with epoxy this time). 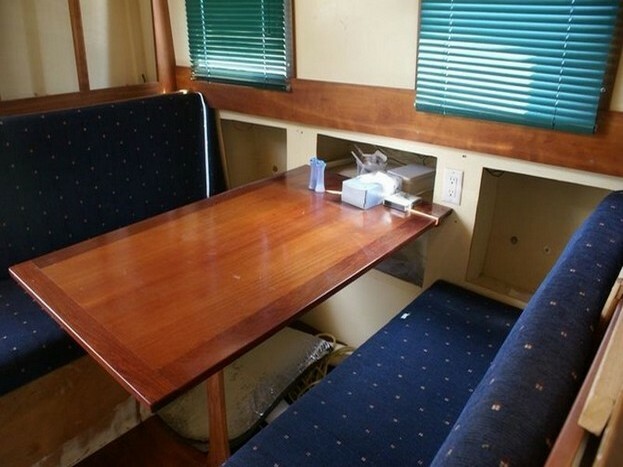 All horrible yellow painted plywood panelling in the boat replaced with stippled fiber reinforced plastic panels from Home Depot. 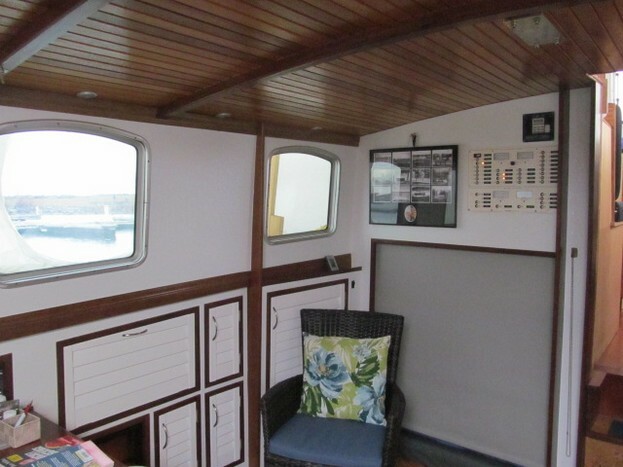 Projects - First will be getting the Flagship Marine heating/air conditioning installed beforethe cold wather rolls in and all new Bomon windows for a start. She has no refrigerator so I'll have to figure that one out and then convert the head compartment into a head/shower compartment. 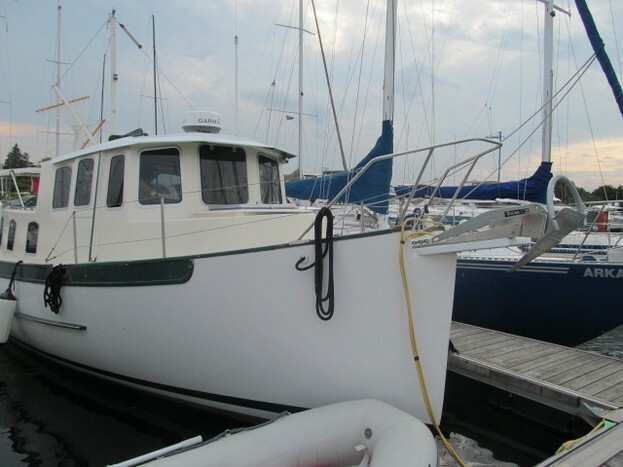 Next up she will have her entire ground tackle system rebuilt as it is rather poorly designed and came apart in a storm on Lake Erie on the trip back to Port Credit Yacht Club. While all this is going on hinged hatches will be retro-fitted everywhere possible in the sole and the DC system will be rebuilt. 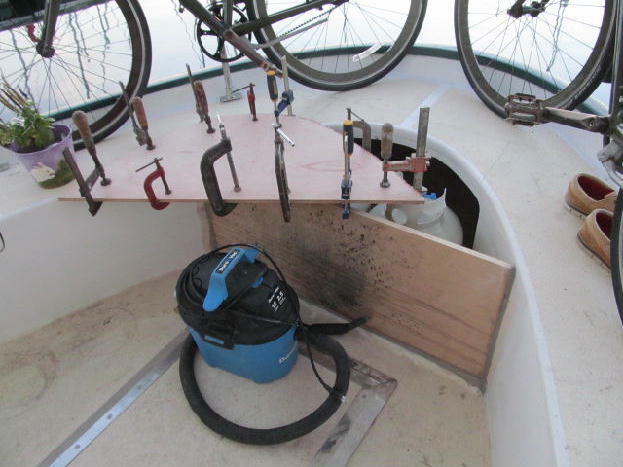 The bilges and engine will be scrubbed, bleached, sanded and painted white. 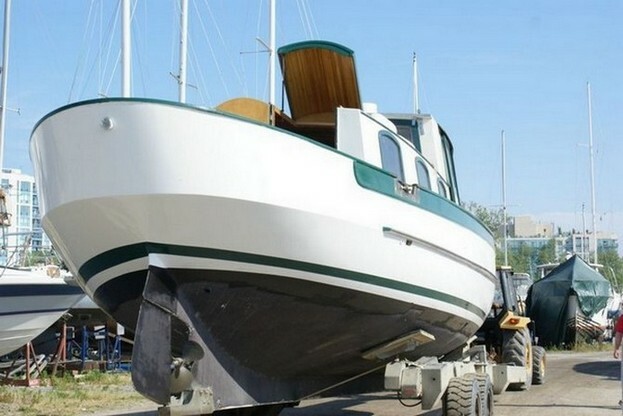 By spring she should be a presentable little boat and you should see her out on the water. There are many other projects in the works and I'll try and document them here. The entire project will be completed before august 2016 as that is when we leave for the Bahamas. This is a work in progress and the blank spots for the "after" photos will be filled in as we go. The cockpit did not drain, there were two small, inadequate scuppers and there was no arch in the deck to direct water to the scuppers. 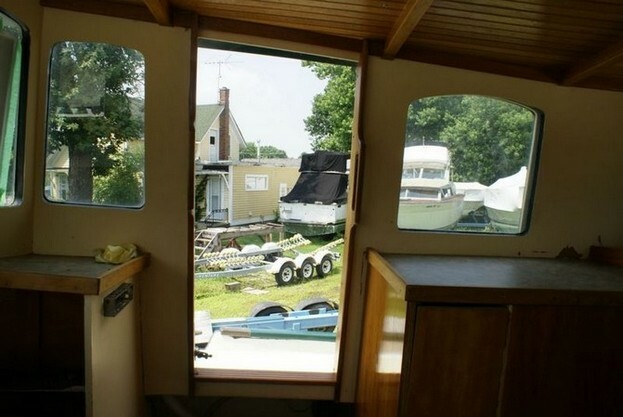 There was a 1/4" high sill around the hatch which was 3/4" higher than the deck and a trip hazard so that water backed up on the deck and flooded the engine compartment/steering gear compartment.. We had to build a new deck over the old to have room to fit gutters around the hatch. There was no propane locker so we had to build one of those too, into the aft end of the cockpit. Neither were there gutters around the side locker hatches so those filled with water when it rained. 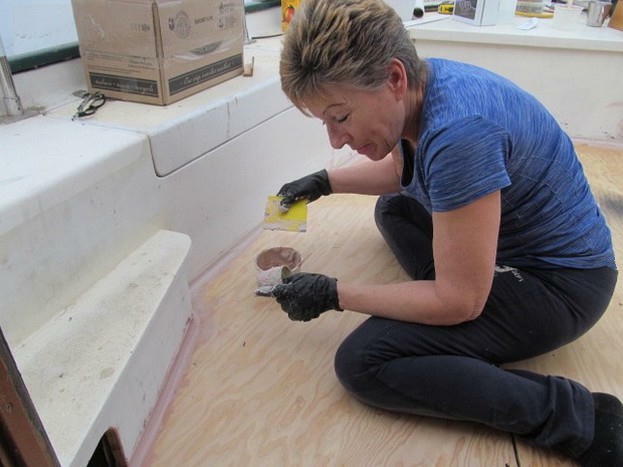 We started with a new bimini / stern rail and progressed through re-sking the deck with an arch to improve drainage, the addition of a proper propane locker, new hatches with drain gutters. ( Can you imagine a huge engine hatch with no gutters ? ) and Sharons impeccable new non-skid. No propane locker, raised deck hatch without gutters routinely flooded engine compartment. The odd shape of the rudder and lack of balance (contrary to Benford's original design) meant that a lot of the prop wash did not move over the largest part, this made turning at low speeds quite difficult without using the bow thruster. While hauled for fresh bottom paint we added two 20" X 7" stainless steel "fish tails". The greater surface area within the prop wash and the 15° angle on the tails has made a dramatic difference to turning ability in close quarter manouvering. Re-painted the bottom. How many wives would get under the plastic with a sander, my wife is awesome ! My photo is the aftermath of sanding with goggles and a mask. 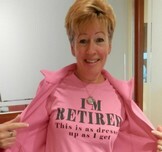 That crap gets under everything but Sharon looked as cute as a button in her painting outfit. PS. I'm too old for this stuff. I will never do another bottom job ! My wife is so damned cute ! Between September 2014 and June 2015 we installed 17 custom Bomon windows and one brass port hole. 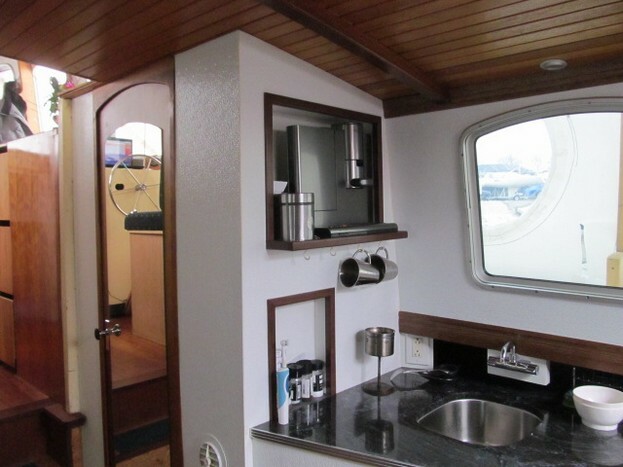 I've installed Bomon windows on my two previous boats so obviously I am quite pleased with them. The windows were by far the biggest job we will undertake on Dirt Free as the old windows were simple wooden frames over glass rabbeted into the structure. The damage done in getting these rotten wood frames off was substantial. 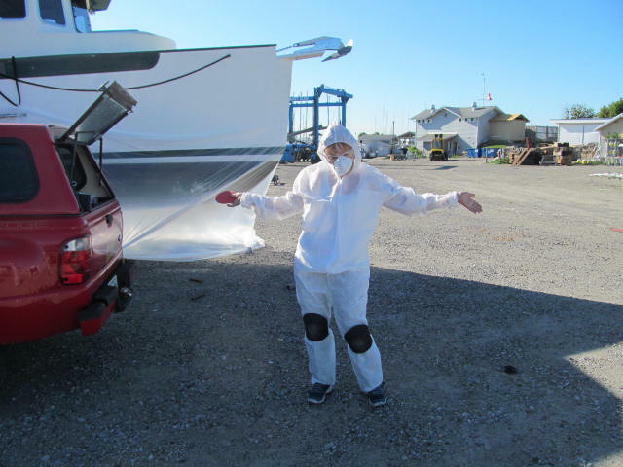 We also repainted the entire superstructure and Sharon did all the non-skid after re-glassing much of it. New hatch and new structure glassed in place ready to be trimmed out for the new windows. I had planned an entire morning to remove the badly leaking butterfly hatch that you see in the "before" photo at left below ... it was completely rotten and took all of 30 seconds. 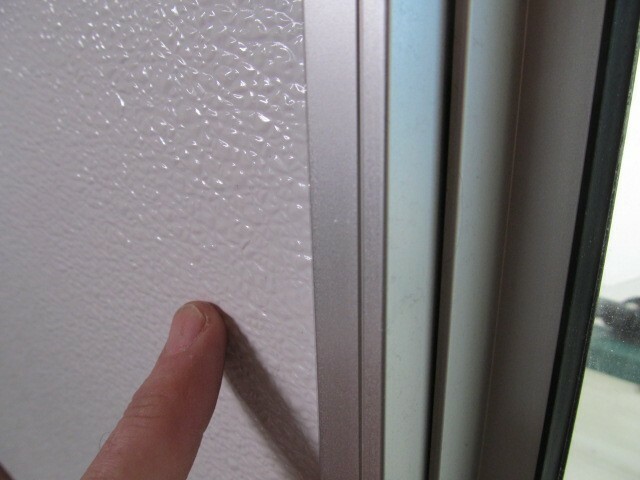 The butterfly hatch was replaced with a heavy duty aluminum frame unit. 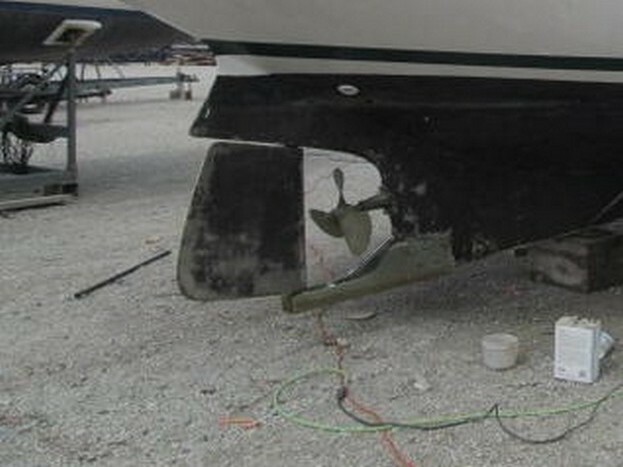 New Bow rail, $50.00, Stachions and life lines free from a boat being scrapped, 55lb. Rocna $300.00. Hull shape, smallish propleller, smallish rudder with flow directed low all add up to the fact that Dirt Free does not like to turn at low speed so the old single crew trick of hammering the throttle with the rudder hard over and then going to reverse does not work as well as it did on my other single screw boats so a thruster is the immediate fix. Later on I will make some rudder modifications and see if that helps. 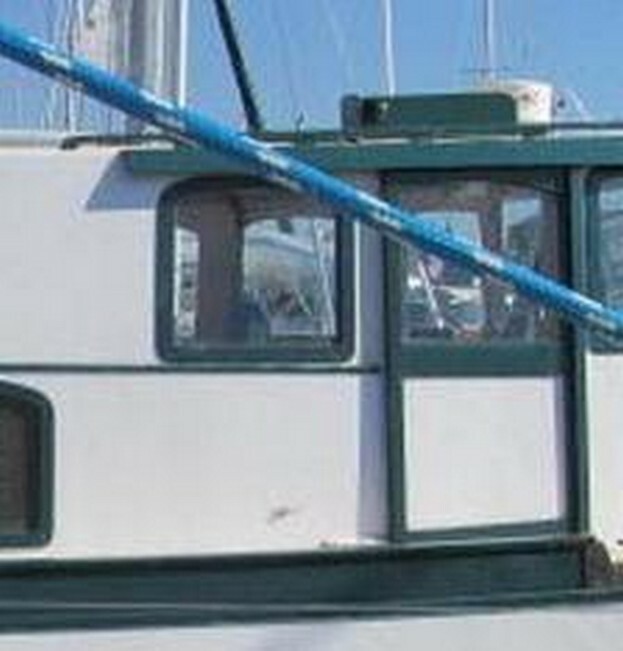 Note the illegal below the sheerline placement of the stern light. She also came with no forward running light or anchor light and had been cruised in that condition. First ..... cut a really big hole ! Add lots of filler then sand, sand, sand and sand some more. 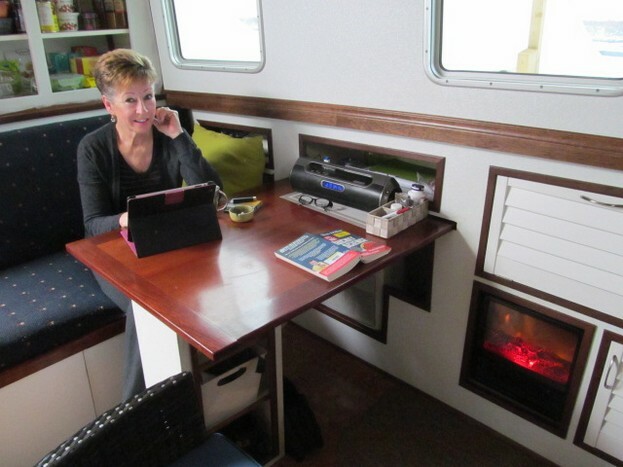 Hard to believe it was built with no bilge access ! Table now retracts. Got rid of this wall with sliding privacy pabel and settee The ceiling, the only thing worth keeping. Nice piece of drift wood huh ? Sharon has always wantee crown molding. Who am I to deny her ! 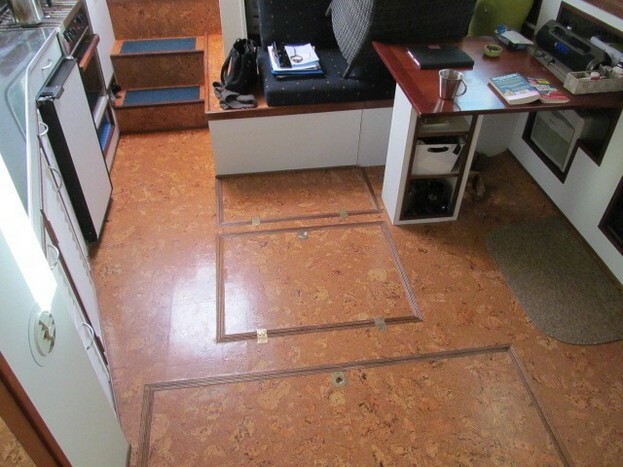 The head compartment had hardwood floors which we ripped out. We then built a drain pan so we could install a shower and covered all surfaces with the same FRP panels we used in the saloon and elswhere. The ubiquitous yellow painted plywood, a wheel that will impale you in rough seas. We Cut 9' off the mast so we could do the New York State Canal System then rigged a hammock to the boom. At some point this summer the boom will be rigged to lift our new dinghy on to the cabin trunk If all goes well we will also rig the mast with a steadying sail. I don't really think it will accomplish much but it will look kinda neat especially if we can get a tanbark square top.